Sometimes recipes that you really enjoy get filed away and forgotten. 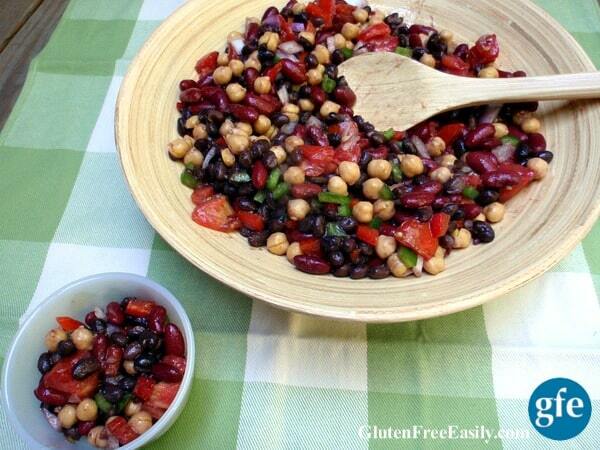 Such was the case with this Easy Bean Salad that was created by my friend Jennifer Richardson. She made it for one of our support group meetings long ago and everyone in attendance loved it. For our meetings, members made a habit of listing the ingredients in their dishes on accompanying index cards. Those served as our homemade ingredient labels, so that those with additional food intolerances (which was most of us in attendance) would know what could be eaten safely. Another member asked Jennifer if she could keep the index card for her bean salad so that she would be able to re-create this salad on her own later. Jennifer happily obliged, which meant that when I asked her for this recipe, she had to call up the ingredients from memory. She had made this bean salad on the spur of the moment with ingredients on hand. Those are always my very favorite kinds of recipes because they don’t require special ingredients and it’s very satisfying to create a meal from one’s pantry. Jennifer must have remembered well because this bean salad tasted just as wonderful as I remembered! As you can see this Easy Bean Salad makes a very attractive dish. It’s one of those recipes that exemplify that real food is beautiful. Everyone will be drawn to this salad by its appealing colorful appearance alone, but they’ll love the mix of flavors and textures as well. I shared my last bean salad with my mom and my aunt and they both really enjoyed it. By the way, I was channeling my mom in the photo below. My mom is loved by everyone for so many things, but she’s always been loved by her children and her grandchildren for placing their vegetables and salads in their own individual bowls. Her special attention ensures that there’s no unappealing “mixing” of foods on their plates. When you’re a kid, that is a true act of love! I ate a little of this Bean Salad each day for about 5 days and it was still delicious and fresh on Day 5, so I know that it will keep at least that long. But you won’t have to worry about how long it will last if you take it to an event because it’s likely to disappear very quickly! In large bowl, mix all ingredients except the dressing ingredients. Set aside. Add olive oil to large glass measuring cup to ¼ cup mark. Add lemon juice, seasoning of choice, and sea salt. Mix well. Pour dressing over remaining ingredients in large bowl. Mix well. Originally posted August 29, 2016; updated April 19, 2018. Thanks, Judee. Hope you had a wonderful vacation! This looks delicious and pretty. I love your mom’s idea of putting veggies in a separate dish. I always do that with a green salad but I like the idea for other veggies and salads as well. I too have always loved bean salads, but I really liked reading this recipe and I know I will love eating it! So colorful and happy looking, it practically begs you to pick up your spoon and start eating! I will definitely add this to the Labor Day menu! I love bean salads, they’re so quick to put together and this recipe is perfect for all and I don’t care if they’re old school, they’re yummy! I laughed when you stated your Mum put vegetables and salads in separate bowls for the children, it’s such a good idea, I remember having to do it for one of mine who hated his food being “touched”. Even I like to have my salad in a separate bowl most of the time, even now! Hi, Vicky! More and more I’m returning to my old school recipes because they are so good. (Although I’m not sure that I’ve ever totally gotten away from them to be honest. LOL) Bean Salad is not one you hear mentioned often any more, but it sure stands the test of time for looks and goodness–both nutritionally and taste wise. The separate bowl works for so many reasons. 😉 All of us love it! I love beans. 🙂 This salad looks great. 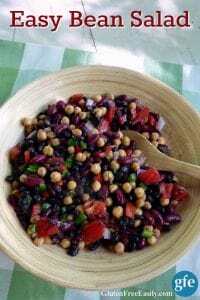 Love this bean salad looks delicious and healthy thanks for sharing with Hearth and soul blog hop, pinning and tweeting. Hi Swathi–Yes, on both I’m happy to say. 🙂 Thank you for all the sharing! !